Xhosa (/ˈkɔːsə, ˈkoʊsə/) is an Nguni Bantu language with click consonants ("Xhosa" begins with a click) and is one of the official languages of South Africa. It is also an official language of Zimbabwe. "Xhosa is spoken as a first language by 8.2 million people and by 11 million as a second language in South Africa, mostly in Eastern Cape Province. Total number of users in all countries is 19.2 million (Ethnologue)". Like most other Bantu languages, Xhosa is a tonal language; the same sequence of consonants and vowels can have different meanings, depending on intonation. Xhosa has two tones: high and low. Xhosa is written with the Latin alphabet. Three letters are used to indicate the basic clicks: c for dental clicks, x for lateral clicks and q for post-alveolar clicks (for a more detailed explanation, see the table of consonant phonemes below). Tones are not normally indicated in writing. Xhosa is part of the branch of Nguni languages known as Zunda languages, which also include Zulu, Southern Ndebele and Northern Ndebele. Zunda languages effectively form a dialect continuum of variously mutually intelligible varieties. Xhosa is, to some extent, mutually intelligible with Zulu and Northern Ndebele, and other Nguni languages to a lesser extent. Nguni languages are, in turn, part of the much larger group of Bantu languages. 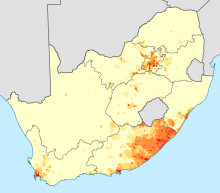 Geographical distribution of the Xhosa in South Africa: density of Xhosa home-language speakers. Xhosa is the most widely distributed African language in South Africa, though the most widely spoken African language is Zulu. It is the second most common home language in South Africa as a whole. 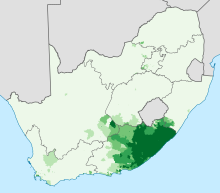 As of 2003[update] approximately 5.3 million Xhosa-speakers, the majority, live in the Eastern Cape, followed by the Western Cape (approximately 2 million), Gauteng (671,045), the Free State (246,192), KwaZulu-Natal (219,826), North West (214,461), Mpumalanga (46,553), the Northern Cape (51,228), and Limpopo (14,225). There is a small but significant Xhosa community of about 200,000 in Zimbabwe. Also, a small community of Xhosa speakers (18,000) live in Quthing District, Lesotho. Xhosa has several dialects. Maho (2009) lists Mpondo (Pondo), Xesibe, Bomvana, Gaika (Ngqika), Gcaleka, Thembu, Mpondomise, Ndlambe, and Hlubi. Hlubi is the dialect in the former Ciskei; there is the more distinct Hlubi language further north, where Xhosa meets SeSotho. Xhosa has an inventory of ten vowels: [a], [ɛ~e], [i], [ɔ~o] and [u] written as a, e, i, o and u in order, all occurring in both long and short. Xhosa is a tonal language with two inherent phonemic tones: low and high. Tones are rarely marked in the written language, but they can be indicated a [à], á [á], â [áà], ä [àá]. Long vowels are phonemic but are usually not written except for â and ä, which are the results of gemination of two vowels, both with different tones; they have thus become long vowels with contour tones (â high-low = falling, ä low-high = rising). Xhosa is rich in uncommon consonants. Besides pulmonic egressive sounds, which are found in all spoken languages, it has 18 clicks (in comparison, Juǀ'hoan, spoken by roughly 10,000 people in Botswana and Namibia, has 48 clicks, and Taa, with roughly 4,000 speakers in Botswana, has 83 click sounds, the largest consonant inventory of any known language). Also, Xhosa has ejectives and an implosive. Although 15 of the clicks also occur in Zulu, they are used less frequently than in Xhosa. The first six are dental clicks (represented by the letter "c"), made with the tongue on the back of the teeth, and they are similar to the sound represented in English by "tut-tut" or "tsk-tsk" to reprimand someone. The next six are lateral (represented by the letter "x"), made by the tongue at the sides of the mouth, and they are similar to the sound used to call horses. The last six are alveolar (represented by the letter "q"), made with the tip of the tongue at the roof of the mouth, and they sound somewhat like a cork pulled from a bottle. Two additional consonants, [r] and [r̤], are found in borrowings. Both are spelled r.
Two additional consonants, [ʒ] and [ʒ̈], are found in borrowings. Both are spelled zh. Two additional consonants, [dz] and [dz̤], are found in loans. Both are spelled dz. An additional consonant, [ŋ̈] is found in loans. It is spelled ngh. In addition to the ejective affricate [tʃʼ], the spelling tsh may also be used for either of the aspirated affricates [tsʰ] and [tʃʰ]. The breathy voiced glottal fricative [ɦ] is sometimes spelled h.
The ejectives tend to be ejective only in careful pronunciation or in salient positions and, even then, only for some speakers. Otherwise, they tend to be tenuis (plain) stops. Similarly, the tenuis (plain) clicks are often glottalised, with a long voice onset time, but that is uncommon. The murmured clicks, plosives and affricates are only partially voiced, with the following vowel murmured for some speakers. That is, da may be pronounced [dʱa̤] (or, equivalently, [d̥a̤]). They are better described as slack voiced than as breathy voiced. They are truly voiced only after nasals, but the oral occlusion is then very short in stops, and it usually does not occur at all in clicks. Therefore, the absolute duration of voicing is the same as in tenuis stops. (They may also be voiced between vowels in some speaking styles.) The more notable characteristic is their depressor effect on the tone of the syllable. When consonants are prenasalised, their pronunciation and spelling may change. The murmur no longer shifts to the following vowel. Fricatives become affricated and, if voiceless, they become ejectives as well, at least with some speakers: mf is pronounced [ɱp̪fʼ], ndl is pronounced [ndɮ], n+hl becomes ntl [ntɬʼ], n+z becomes ndz [ndz], etc. The orthographic b in mb is the voiced plosive [mb]. When voiceless clicks (c, x, q) are prenasalised, the silent letter k is added (nkc, nkx, nkq) to prevent confusion with the nasal clicks nc, nx, nq. /pʰ/, /tʰ/, /c̟ʰ/, /kʰ/ /mp/, /nt/, /ɲc̟/, /ŋk/ Aspiration is lost on obstruents. /kǀ/, /kǁ/, /kǃ/ /ŋǀʱ/, /ŋǁʱ/, /ŋǃʱ/ Plain clicks become slack voiced nasal. /kǀʰ/, /kǁʰ/, /kǃʰ/ /ŋǀˀ/, /ŋǁˀ/, /ŋǃˀ/ Aspirated clicks become glottalised nasal. /ɓ/ /mb̥ʱ/ Implosive becomes slack voiced. [ɱb̪̊vʱ], [nd̥zʱ], [nd̥ɮʱ], [ŋɡ̊ɣʱ]? Fricatives become affricates. Only phonemic, and thus reflected orthographically, for /nts/, /ɲtʃ/, /ntɬ/ and /ŋkx/. /m/, /n/, /ɲ̟/ /m/, /n/, /ɲ̟/ No change when the following consonant is itself a nasal. Palatalisation is a change that affects labial consonants whenever they are immediately followed by /j/. While palatalisation occurred historically, it is still productive. Moreover, Xhosa does not generally tolerate sequences of a labial consonant plus /w/. Whenever /w/ follows a labial consonant, it changes to /j/, which then triggers palatalisation of the consonant. In keeping with many other Southern Bantu languages, Xhosa is an agglutinative language, with an array of prefixes and suffixes that are attached to root words. Like in other Bantu languages, nouns in Xhosa are classified into morphological classes, or genders (15 in Xhosa), with different prefixes for both singular and plural. Various parts of speech that qualify a noun must agree with the noun according to its gender. Agreements usually reflect part of the original class with which the word agrees. The word order is subject–verb–object, like in English. The verb is modified by affixes to mark subject, object, tense, aspect and mood. The various parts of the sentence must agree in both class and number. The Xhosa noun consists of two essential parts, the prefix and the stem. Using the prefixes, nouns can be grouped into noun classes, which are numbered consecutively, to ease comparison with other Bantu languages. The following table gives an overview of Xhosa noun classes, arranged according to singular-plural pairs. 1 Before monosyllabic stems, e.g. iliso (eye), uluhlu (list). 2 is- and iz- replace isi- and izi- respectively before stems beginning with a vowel, e.g. isandla/izandla (hand/hands). 3 The placeholder N in the prefixes iN- and iiN- for m, n or no letter at all. 4 Before monosyllabic stems in some words. Nelson Mandela was a famous Xhosa man. Xhosa-speaking people have inhabited coastal regions of southeastern Africa since before the 16th century. They refer to themselves as the amaXhosa and their language as Xhosa. AmaXhosa migrated to the east coast of Africa and came across Khoisan-speaking people; "as a result of this contact, the Xhosa people borrowed some Khoisan words along with their pronunciation, for instance, the click sounds of the Khoisan languages". The Bantu ancestor of Xhosa did not have clicks, which attests to a strong historical contact with a San language that did. An estimated 15% of Xhosa vocabulary is of San origin. In the modern period, it has also borrowed, slightly, from both Afrikaans and English. The first printed word in Xhosa came out in 1823 from the Lovedale Press in the Alice region of the Eastern Cape. But, as with any language, Xhosa had a rich history of oral traditions from which the society taught, informed, and entertained one another. 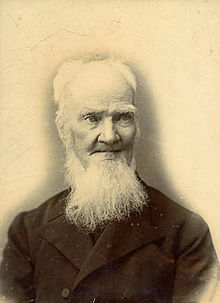 The first Bible translation was in 1859, produced in part by Henry Hare Dugmore. The role of indigenous languages in South Africa is complex and ambiguous. Their use in education has been governed by legislation, beginning with the Bantu Education Act, 1953. At present, Xhosa is used as the main language of instruction in many primary schools and some secondary schools, but is largely replaced by English after the early primary grades, even in schools mainly serving Xhosa-speaking communities. The language is also studied as a subject. The language of instruction at universities in South Africa is English or Afrikaans, and Xhosa is taught as a subject, both for native and for non-native speakers. Literary works, including prose and poetry, are available in Xhosa, as are newspapers and magazines. TThe South African Broadcasting Corporation broadcasts in Xhosa on both radio (on Umhlobo Wenene FM) and television, and films, plays and music are also produced in the language. The best-known performer of Xhosa songs outside South Africa was Miriam Makeba, whose Click Song #1 (Xhosa Qongqothwane) and "Click Song #2" (Baxabene Ooxam) are known for their large number of click sounds. In 1996[update], the literacy rate for first-language Xhosa speakers was estimated at 50%. Lord, bless us, your family. Additional stanzas were written later by Sontonga and other writers, with the original verse translated into Sotho and Afrikaans, as well as English. In the Marvel Cinematic Universe films Captain America: Civil War and Black Panther, the language spoken in the fictional African nation of Wakanda is Xhosa. This came about because South African actor John Kani, a native of the Eastern Cape province who plays Wakandan King T'Chaka, speaks some Xhosa and suggested that the directors of Civil War incorporate dialogue in the language. For Black Panther, director Ryan Coogler "wanted to make it a priority to use Xhosa as much as possible" in the script, and provided dialect coaches for the film's actors. UCLA Language Materials Project, an online project for teaching languages, including Xhosa. ^ Hammarström, Harald; Forkel, Robert; Haspelmath, Martin, eds. (2017). "Xhosa". Glottolog 3.0. Jena, Germany: Max Planck Institute for the Science of Human History. ^ "Xhosa – Definition and pronunciation". Oxford Learner's Dictionaries. Oxford University Press. Retrieved 16 April 2014. ^ "Xhosa – pronunciation of Xhosa". Macmillan Dictionary. Macmillan Publishers Limited. Retrieved 16 April 2014. ^ "Xhosa alphabet, pronunciation and language". www.omniglot.com. Retrieved 6 July 2017. ^ The following languages, namely Chewa, Chibarwe, English, Kalanga, Koisan, Nambya, Ndau, Ndebele, Shangani, Shona, sign language, Sotho, Tonga, Tswana, Venda, and Xhosa are the officially recognised languages of Zimbabwe. l(CONSTITUTION OF ZIMBABWE (final draft) Archived 2013-10-02 at the Wayback Machine). ^ a b "Xhosa | About World Languages". aboutworldlanguages.com. Retrieved 11 December 2017. ^ Anonymous (3 April 2011). "Xhosa". www.sahistory.org.za. Retrieved 6 July 2017. ^ "Xhosa". Ethnologue: Languages of the World, Nineteenth edition. SIL International. Retrieved 30 January 2017. ^ "Xhosa Language | Effective Language Learning". www.effectivelanguagelearning.com. Retrieved 6 July 2017. ^ Jessen, Michael (2002). "An acoustic study of contrasting plosives and click accompaniments in Xhosa." Phonetica, 59: 150–179. ^ These are analogous to the slack-voice nasals mh, nh, etc. They are not prenasalized, as can be seen in words such as umngqokolo (overtone singing) and umngqusho in which they are preceded by a nasal. ^ per Derek Nurse, The Bantu Languages, p 616. Zulu does not have this series. ^ Michael Jessen; Justus C. Roux (2002). "Voice quality differences associated with stops and clicks in Xhosa". Journal of Phonetics. 30 (1): 1–52. doi:10.1006/jpho.2001.0150. ^ Eligon, John (16 February 2018). "Wakanda Is a Fake Country, but the African Language in 'Black Panther' Is Real". The New York Times. ISSN 0362-4331. Retrieved 7 May 2018. Look up Xhosa in Wiktionary, the free dictionary. Wikivoyage has a travel guide for Xhosa phrasebook. Wikimedia Commons has media related to Xhosa language. This page was last edited on 29 March 2019, at 16:47 (UTC).